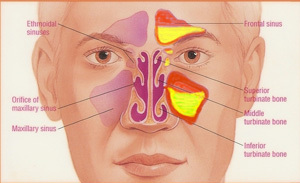 Sinusitis refers to an inflammation of the mucus membrane lining the paranasal sinuses. It often follows a common cold, influenza, and other general infections. Infecting germs sometimes find their way into sinuses or chambers on either side of the nasal passage, leading to sinus trouble. The sinuses are basically moist air passages that are hollowed out in the facial bones, behind and around the nasal area. The sinuses are classified into four groups, with the frontal sinuses situated towards the eyebrows, while the cheekbones house the maxillary sinuses. The ethmoid sinuses are located just between the eyes, and behind them are the sphenoid sinuses. It can be explained a condition in which a person experiences severe and acute inflammation in the air filled cavities present inside the human skull.it can be happen to all ages humans.asthmatic patient have more risk of sinusitis.children who sufferin from this can have pain in ears, cold, viral diseases, headaches.the sinus are lined with membranes that secrete antibody-contaning mucus, which protects the respiratory passage from the onslaught of irritants in the air we breath. Applying a hot compress over the inflamed area works in sinus. Avoid contact with people whoare having cold & flu. Use humidifier in home to moisten the air. Inhale of steam is too god in sinus. Mix 2 spoon of apple cider vinegar with a glass full of warm water,drink 2-3 times a day gives relief in sinus. Chap fresh garlic and add in a bowl of hot water and take steam of that water is too god for sinus.2-3 times a day. Intake of Ginger juice 1- 2 tea spoon a day also works in sinus . Intake of Adrak juice with honey is effective too. Intake of Turmeric with honey or milk also works. Intake of Kaali mirch with badam is very effective in sinus. Soak 4-5 garlic seeds in water for sometime,and make a paste of it and then inhale its fragrance. Apply overhead a paste of cinnamon(1-2 tea spoon of powder) with water is effective for sinus.